Powerful Tools for Any Sampler	All Chicken Systems run on Mac computers from OSX 10.12 (Sierra) down to OSX 10.4 (Tiger), and on Windows 10 down to Windows XP. The amount of supported samplers is staggering - to the latest Kontakt/MachFive technologies, to hardware samplers made in the 1980's! Purchase at SamplerZone.com! Now heading to our 30th year, Chicken System's software are the industry standard for Conversion, Building, and Management. 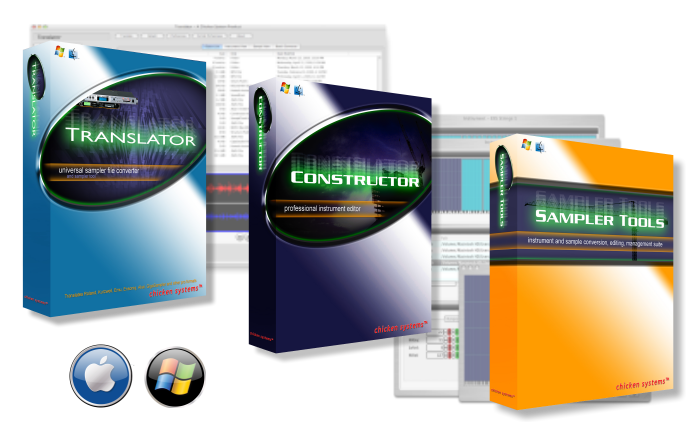 Translator™ 6 converts any instrument format to any other instrument format. Version 6 works on modern operating systems - Mac and Windows - plus it looks and feels like a modern program. Not only that, it offers a vastly expanded format list. Constructor™ is a generic multi-format, cross-platform Instrument Builder, allowing you to create any multisampled Instrument from scratch - using WAVE/AIFF or ANY pre-existing instrument OF ANY FORMAT. Then, you can save your Instruments directly into any format - software AND hardware! Instrument Manager™ manages Instruments, Banks and Samples of ANY Software or Hardware sampler. Use it as a Super-Browser, view in four different ways, with an "iTunes-ish" interface. Repair bad sample links - and swap sample sets out with ease. It's powerful database engine allows instant access to any group of sounds. We develop software for professional sampler musical instruments, software and hardware. We support high-end and popular sofware such as Native Instruments Kontakt, Apple's EXS24, and Digidesign's Structure. 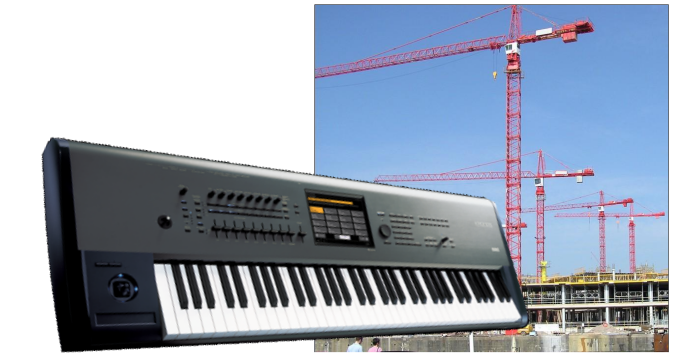 We also support modern workstations such as the Yamaha Motif and Roland Fantom-G. We support boutique super-high-end sampler behemoths such as Syclavier, Fiarlight, and Waveframe. Lastly, we support older hardware samplers, such as Akai, Emu, Roland, Ensoniq, and Kurzweil - not just reading but also writing. Our time-tested (14 years) sampler disk/file format handling technology is avaialble for licensing. Some of our more visible clients include Native Instruments, Creative Labs, Emu, FLStudio (Image-Line), Nine Volt Audio, Garritan, A.I.R. (Structure and Digidesign) and many more. Since 19987 Chicken Systems (as its dba Rubber Chicken Software Co.) created many libraries for the Ensoniq EPS, 16-Plus, ASR-10, and ASR-X. Two packed CD's were eventually produced, and RCS also bought and distribute 5 other CD's, one of note is "The Demos" by Pelle Piano from Sweden. Chicken Systems also has helped sound library developers such as Garritan, Dan Dean, Numerical Sounds, Sonic Reality, Nine Volt Audio, ArtVista, EastWest, and many others. Chicken Systems also helps many film composers and famous artists/bands, such as John Powell and the band Rush. We are addicted as much to supporting oour products and services as we are creating them. Since 1988 - 25 years years worth - we field as much as 100 queries daily. No matter what we create or produce, you can always talk to the "person in charge" at anytime. Call us, email us, chat with us, visit with us. We're here! Jeff Godbloch: Electronic Customer Support representative, programmer, and head of product documentation. Roger Weingarten: Programmer; documentation assistant. Cheryl Ann Mays: Handles SamplerZone.com, all sales, and shipping. We send out information every other week.